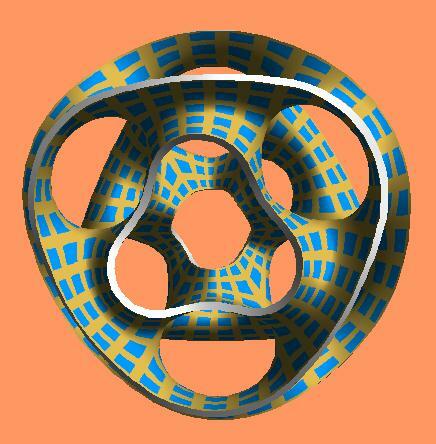 This is a toroidal ring of six 3rd order saddles. This was the first collaborative sculpture between Brent Collins and Carlo Séquin. This part is a geometrical scale model for a sculpture that I have developed jointly with Brent Collins, a wood sculptor living in Gower, Missouri. It might get exhibited together with its corresponding wood sculpture in an exhibit later this year. This experiment is also part of a research program sponsored by NSF to streamline the process of rapid prototyping of free form parts, by defining a clean interface between designers and fabricators. The scale or strength of this model is not critical; it can be scaled so as to fit optimally a particular process or some remaining space in a run of a larger piece. The STL files describe a part with a diameter (in x) of 6.32 units and a thickness (in y) of 2.58 units. The surface walls are 0.12 units thick. Ideally we would like a part several inches in diameter. Orientation is not critical either. However, for a layered manufacturing process (SLA, SLS, etc), it might be best to turn the object 90 degrees around the x-axis, thereby giving the part minimal height, and preserving its 3-fold symmetry ideally. The part is front-to-back symmetrical. The file can be uncompressed with: gunzip hexmonkey.stl.gz .